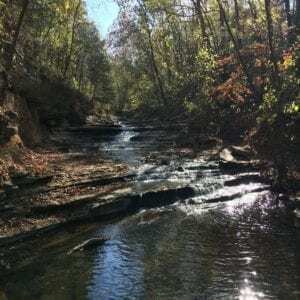 Multi-use trails are a great way to get from place to place, spend time with the family and enjoy the beautiful Ozark scenery with its rivers, streams, forests, hills and meadows. See the list below for multi-use trails near you. Below are the top Multi-Use Trails in Northwest Arkansas. Razorback Regional Greenway Trail System is a 36-mile, mostly off-road shared use biking, hiking and pedestrian trail meandering from Bentonville, Rogers, Lowell and Springdale to Fayetteville. 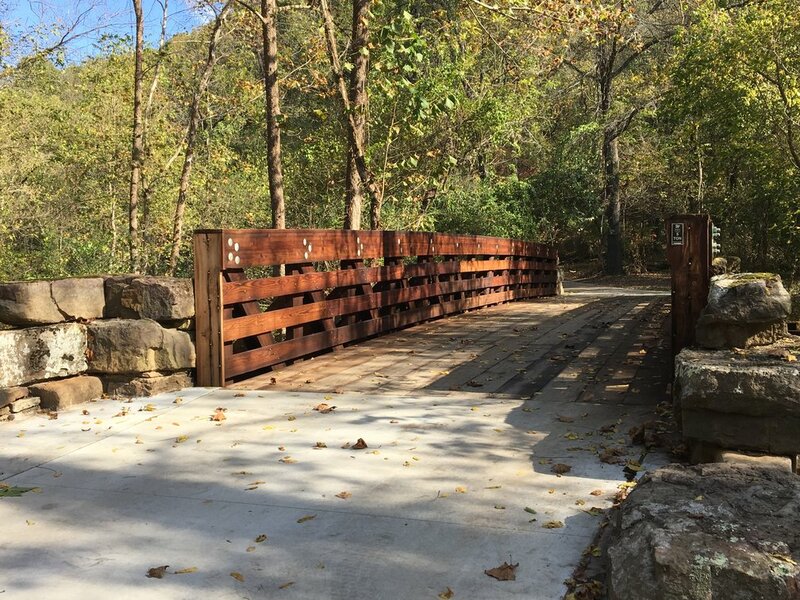 The popular shared-use 36-mile Razorback Greenway Trail system is the heart of the trail system in Northwest Arkansas. For easy access, see interactive map showing multiple trail heads at: . The Tanyard Creek Nature Trail features a 2.2-mile loop complete with a swinging bridge and a view from above the Lake Windsor waterfall. It is located approximately 1.5 miles west of U.S. 71 on Highway 340 in Bella Vista. This marked, paved 1.75-mile trail features benches, picnic tables, a playground and a Disc Golf Course. The lake covers 22 surface acres and is approximately 8 feet deep. Located adjacent to U.S. 71, Lake Bella Vista Trail is perfect for bikers, walkers and dog walkers. Crystal Bridges 120-acre property has numerous, beautiful shaded multi-use trails. Be immersed in natural beauty, and be amazed by stunning sculpture gardens all along the trail including an overlook to Crystal Bridges, and a trail that takes you to Crystal Springs, the spring for which the museum derived its name. Lake Leatherwood Trail one mile trail is mostly flat and is perfect for the light hiker, runner or beginning cyclist. Lake Leatherwood City Park offers visitors 1,600 acres of beautiful Ozark Mountain countryside, an 85-acre spring-fed lake, hiking, picnicking, walking trails, mountain bike trails, camping, fishing, cabins and a small marina for boating, canoes and paddle boats,all of which add up to fun for the entire family! Considered the backbone of the city’s growing trail system, Scull Creek Trail is a 12-foot wide paved surface lined with mature trees and lighting. The trail features a 650-ft. pedestrian tunnel, which happens to be the longest in the state. Scull Creek Trail also connects several other multi-use trails including Frisco Trail, Meadow Valley Trail, Mud Creek Trail and Clear Creek Trail. These trails together provide a continuous route throughout Fayetteville. Gulley Park is one of Fayetteville’s most popular parks. The 1.5-mile Gulley Park Trail is a lighted hard-surface trail that is perfect for an easy jog or a leisurely walk and is also suitable for baby strollers. The park has a creek, sand volleyball court, gazebo, picnic tables, a large playground and large open areas that are great for picnics or playing with your dog. The Clear Creek Trail is 2.3 miles long and runs along, you guessed it, Clear Creek for most of the trail. This peaceful scenic trail also serves to link two of the city’s most popular trails: the Scull Creek Trail in the west and the Lake Fayetteville Trail in the east. Lake Fayetteville is a 194-acre lake on the northern edge of Fayetteville. The trail is a 5.5-mile paved and soft surface multi use trail that features a pedestrian bridge and a waterfall. The park itself is 640 acres, and offers many recreational opportunities including hiking, picnicking, softball and other sports, as well as boating and fishing. Lake Atalanta trails, lake and park are some of the most scenic outdoor treasures in NWA. The park, taken together, includes the RailYard, 2000 ft. of boardwalk, 4 miles of hard surface trails, 10 miles of soft surface trails, nature area, serenity garden, 5 pavilions and restrooms. If you haven’t been there yet, you will be amazed at all it has to offer for all age groups.